Give Your Website Visitors a Virus? Because you are hosting content that is not native to today's modern browsers, 18,769,510 bytes of joy will need to be running on your users computer, (Plan Gator's current version only requires the client PC to run 1/1000th of that.) Now that your web visitor has the Flash Player installed and running so that they can view your Flash based Floor Plans the real fun can begin. Adobe Flash Player is a total consumption hog. 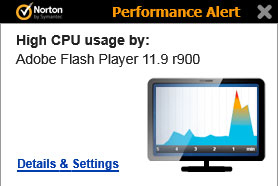 The Flash Player can at times take over 100% of CPU usage. 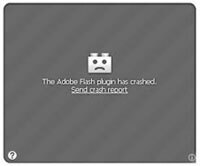 Depending on factors such as how long the CPU has been running and what other applications the user has open this can lead to exciting system messages like unresponsive plugin, plugin has crashed, or the entire browser could just crash! Even if the user is not greeted with any of the above messages their browser could just begin performing so poorly, performance that is eerily similar to how a browser may be running when the machine is infected with a virus. Speaking of which, Adobe Flash has a long history of security vulnerabilities. Take a look at this list of 304 such issues as of Jan. 15, 2014. 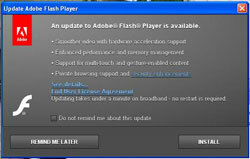 Now, I wouldn't worry too much about those pesky security issues because those who have installed the Flash Player will get nearly constant popup messages nagging them on the need to update their fancy "little" Flash Player. In the past the friendly folks at Adobe have been known to come out with security updates as many as 3-4 times per month. It is rumored that Steve Jobs once said, "Apple does not support Flash because it is so buggy, he says. Whenever a Mac crashes more often than not it's because of Flash. No one will be using Flash, he says. The world is moving to HTML5." That leads us to another concern over Flash based Floor Plans. Some of the more savvy web users have decided that having been through so many of the Flash hassles that they simply gave up and chose to disable Flash. A quick Google search of "how do I disable Flash" shows many, many, answers to that FAQ, (that's Frequently Asked Questions for those of you in Loma Linda.) Do you think that someone who made the effort to quash this beastly program will re-install it just to see your Floor Plans? Your Web Analytics program can tell if your Floor Plan was viewed but not if it was used. The content in your Flash Based Floor Plans is often not visible to search engines. Users with visual impairments may have trouble viewing Flash content, which can make it unfair for such users. Many users disable Flash as cited above and because the creators of those wonderful little popup ads littered about the web just love their Flash! So we've got Flash based Floor Plans. What now? Well you could continue to be discourteous to your website users and keep them subjugated to Flash? Or better yet, you could navigate through the Plan Gator™ demos that we have here, take a look at the features that we list, and if you like what you see then give us a call. 1. Many people will already have this installed.